Dies can be supplied with mallet handle for fast, easy hand stamping of test specimens using a maul, or for use in clicker. Special press adaptors can be produced upon request. Other dies, in other dimensions and meeting different standards, are also available. 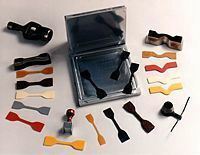 Tear Test Dies possess the same physical features as the Tensile Test Die, including the mallet handle/clicker press option.